Many of us have dreamed of owning or even driving a Formula race car. 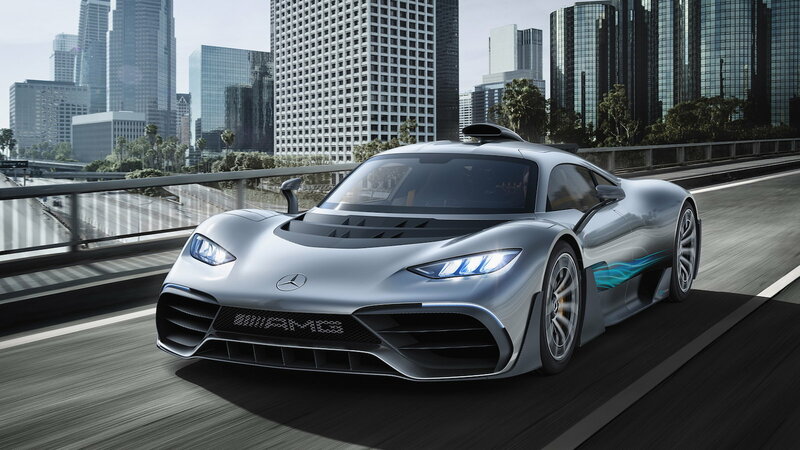 Check out Mercedes-Benz ongoing attempt to make this dream a reality. Mercedes-Benz is no stranger to pushing the boundaries of innovation. This car is a rolling example of street-legal madness. 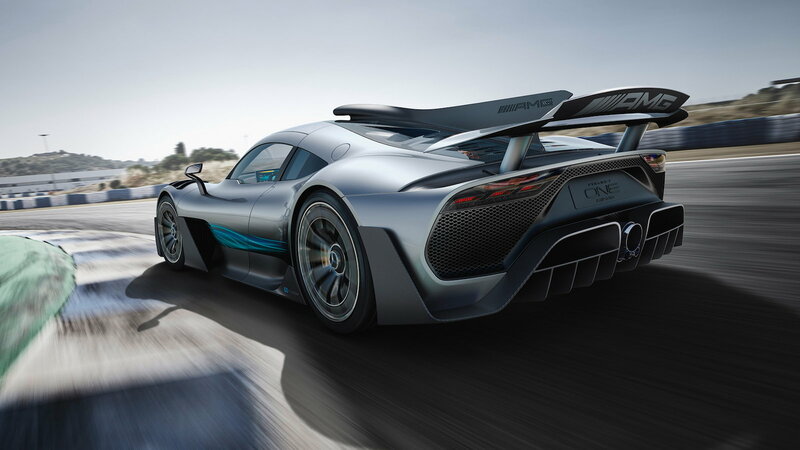 Utilizing a combination of a turbocharged V6 engine from the Silver Arrow Formula One car and four independent electric motors, Project one produces over 1,000 horsepower. Its chassis resembles that of an endurance race car, while its cabin holds true to its luxurious heritage. With smooth flowing lines, it's impressive how the car still manages to create an aggressive stance. The entire chassis is designed to cut through the wind with ease. Large wheel wells paired with the wasp waist design allow bigger wheels to subtly fit. You’ll also notice a very hard-to-miss roof vent acting as an intake for the internal combustion engine, just like the F1 racer. Coincidentally an above view reminds me of a shark, while its performance certainly mimics the agility and aggressive nature of one. The rear-end houses a large two section diffuser, with a massive centrical placed exhaust tailpipe. The diffuser uses a 2-stage system that activities according to the speed the driver is going, helping to adjust aerodynamics on demand. Inside, Mercedes-Benz sticks to its Formula 1 inspiration and follows a simplistic, but effective design. Since it's not about all the high-end functions a standard luxury model car offers, most of the included tech is there for functionality. The cockpit is tight but spacial by making use of recessed seating. This creates a tunnel vision perspective for the occupants leading to what feels like an independent experience when the car is in motion. Two 10-inch touchscreen displays positioned following familiar conventional car placement and stowage compartments are found behind both seats. This new age of driving innovation is one that delivers in all aspects of vehicular engineering. 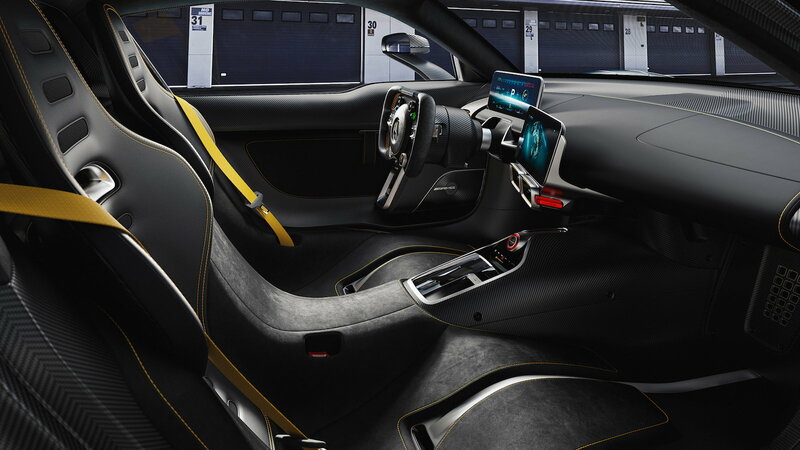 The Project One Hyper Car uses an EQ Power + hybrid drive system which allows the user to choose from multiple driving modes. This gives them the option to either rely solely on the electric motors or utilize the V6 for maximum power output. The smart feature also reacts to how the car is driven. For example, after increasing the speed to where the V6 kicks on, when the driver lets off the accelerator, the car will automatically switch back to the electric drivetrain. Other options include race start, which manages zero to 124 mph in under six seconds. It's always impressive to see just how Mercedes can innovate in the market that they initially created. Whether it's pursuing the prospects of clean energy or looking at new ways to explore speed, the options they design and their functionality are always steps ahead of the competition. One of the unique features seen on this ride is the steering wheel. Taking close inspiration from a Formula 1 race car, the steering wheel is ergonomically designed for the racer in mind. There are two controllers located on the wheel which are programmable by the driver to adjust the suspension and change driving modes. Located at the top of the wheel are LED shift indicators. The engine and drivetrain are both feats in themselves. Inspired and pulled directly from a Formula 1 drivetrain, it features a smart system that causes all of the components to work effortlessly with each other. 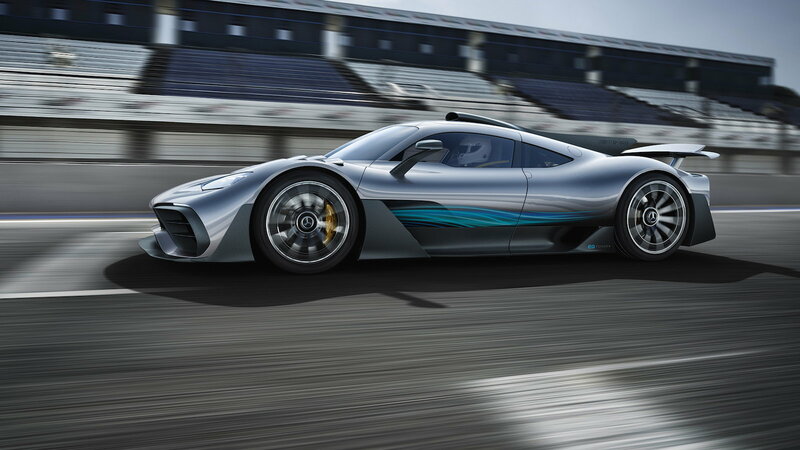 Its 1.6-liter V6 engine was pulled from the Mercedes-AMG Petronas race car. It has a high-revving design allows the engine to reach well up to 11,000 RPM. The four electric motors are also nothing to scoff at, as they can spin up to 50,000 RPM–that’s insane as the normal high performing electrical engines perform at 20,000 RPM. Power is distributed through the all-new automated 8-speed transmission and electric AWD system.